SHANGHAI, Apr, 16 2019 - (JCN Newswire) - Honda has exhibited the world premiere of the X-NV Concept, a concept model of its China-exclusive electric vehicle (EV), at Auto Shanghai 2019 (The 18th International Automobile & Manufacturing Technology Exhibition, press days: April 16-17, 2019, public days: April 18-25, 2019). The X-NV Concept developed jointly by Honda Motor China Technology Co., Ltd. and Dongfeng Honda is a concept model for the first mass-production EV model Dongfeng Honda will introduce exclusively to the Chinese market. The mass-production model based on the X-NV Concept is scheduled to go on sale in the second half of 2019. Honda booth exhibits also include the China premiere of Odyssey Hybrid (a product of GAC Honda), which is scheduled to go on sale in China at the end of April 2019, as well as a booth where visitors can experience the second-generation Honda CONNECT. Last year, Honda announced its mid-term vision for electrification in China, which is to "introduce more than 20 electrified models to the market by 2025." 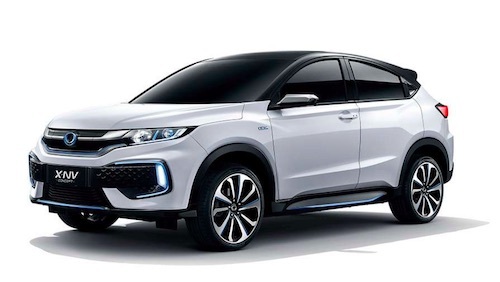 Based on this vision, GAC Honda introduced an EV developed exclusively for the Chinese market, Everus VE-1, last year, and Honda also is planning to introduce plug-in hybrid models starting from 2020. Moreover, in addition to automobiles, Honda introduced the V-GO electric motorcycle and Transcooter electrified micro mobility product last year. Honda will further accelerate electrification of a broad range of mobility products. Honda Motor Co., Ltd. (TSE:7267 / NYSE:HMC / LSE:HNDA) is one of the leading manufacturers of automobiles and power products and the largest manufacture of motorcycles in the world. Honda has always sought to provide genuine satisfaction to people worldwide. The result is more than 120 manufacturing facilities in 30 countries worldwide, producing a wide range of products, including motorcycles, ATVs, generators, marine engines, lawn and garden equipment and automobiles that bring the company into contact with over 19 million customers annually. For more information, please visit http://world.honda.com.